The AeroPress Coffee Maker's unique design combines the infusing properties of a French press with the pressure of an espresso machine, offering one of the smoothest, richest coffees you'll ever taste. The AeroPress is simple, lightweight, durable and portable, making it ideal for coffee on the go, when camping or backpacking. Most of all, it’s easy to use and affordable. Aeropress products have an average rating of 4.7 out of 5 stars from 148 reviews. Whether you’re just starting out and wanting to up your coffee game or a seasoned barista chasing the perfect cup, the AeroPress promises something for every coffee lover. Bloomberg Newsweek says the AeroPress, "may be the world's greatest single-cup coffee maker." 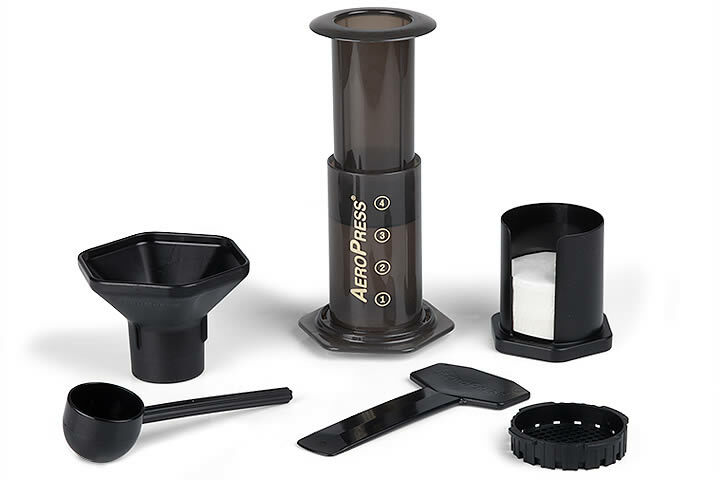 The AeroPress can produce both an americano style coffee or an espresso style concentrate which can be used to make drinks like lattes and cappuccinos. The AeroPress makes great coffee - I prefer it over our French press, drip coffee machine and espresso maker. If you grind your own beans, it adds to a great coffee ritual. Great taste. Fast. Small. Easy to clean. Though the AeroPress includes 350 paper micro filters, we also recommend the reusable Able Disk Metal Coffee Filter — designed specifically for use with the AeroPress. Yuppiechef stocks a growing range of single origin and blended coffee beans and grounds from South Africa's leading coffee roasters. Freshly ground beans make the taste of an AeroPress coffee all the more enjoyable. Manual grinders add to the ritual and are recommended for on-the-go use. You'll love the Fellow Prismo for Aeropress. It's a pressure actuated valve that helps you build up enough pressure to draw espresso-style coffee with ease. It also features a hand no drip seal that will fit directly over an espresso shot glass. Discover a whole new side to coffee and take your home barista skills to the next level with this perfect coffee maker.